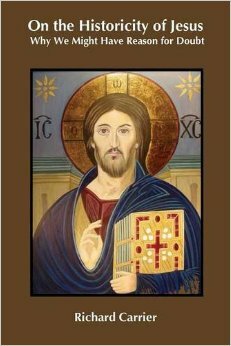 Daniel Gullotta presents his review of Richard Carrier’s On the Historicity of Jesus as a sound scholarly perspective that rises beyond the religious partisanship of previous efforts to address the Christ myth theory. In the rare instances where these theories have been addressed, they are predominantly countered by self-confessed (and typically evangelical) Christian apologists and scholars. “The Jesus mythicists are a group of enthusiastic atheists who through websites and self-published books try to prove the equivalent of a flat earth. I serve on the editorial board for the Journal for the Study of the Historical Jesus, where we have an editorial team of people from all faiths and none, celebrated experts in their fields; and I can tell you that the Jesus mythicist nonsense would never get a foot in the door of a peer-reviewed journal committed to the academic study of the historical Jesus.” — Michael Bird, Dec 2014. Unfortunately, while drawing attention to the “self-confessed Christian” bias of previous responses to mythicism Gullotta indicates that his own effort has been compromised when he expresses “particular” thanks to a number of scholars who are themselves not only “self-confessed Christian apologists and scholars” but also well-known for their disdain for the Christ myth theory (e.g. Craig Evans, Larry Hurtado, James McGrath and others) for their assistance in the preparation of his own review. Even the choice of the Journal for the Study of the Historical Jesus as the publisher of the review adds to the irony given that one of its more stridently apologist editors has said the editorial board is hostile to the very idea of Jesus mythicism (see box insert). I hope to further address Gullotta’s confession that he failed to understand Carrier’s methodology in a future post. Here I address his discussion of Carrier’s “claim that a pre-Christian angel named Jesus existed”. Inspired by the central idea of Doherty’s work, Carrier’s foundational argument is that Jesus was not understood within the earliest days of Christianity as a human-historic figure but rather as a celestial-angelic being, akin to Gabriel in Islam . . . . According to Carrier, ‘some [pre-Christian] Jews already believed there was a supernatural son of God named Jesus — because Paul’s contemporary Philo interprets the messianic prophecy of Zech 6.12 in just such a way’. Carrier draws this conclusion from Philo of Alexandria’s On the Confusion of Tongues 63, which evokes the story of the high priest Joshua, son of Jehozadak, in Zech 6. He then compares the common language used by Philo to describe the logos with the language used by Paul to describe Christ as evidence of their shared belief in this heavenly being named Jesus. The most damning argument against Carrier’s claim is that there is no literary or archeological evidence within the entirety of the Mediterranean world and Second Temple period that validates the existence of this pre-Christian celestial Jesus. In surveying references to angels during this time, one of the most common features in the names of angels is the appearance of the element of ‘el’. This survey reveals that the most common angelic characters of this period were named Michael, Gabriel, Sariel/Uriel, and Raphael. At no point does an angel or celestial being called Jesus appear within Second Temple Judaism, and ‘Jesus’ exhibits all the signs of a mundane name given to a human Jewish male within the period. My response is double-edged. While Gullotta throws Carrier’s argument out of all perspective Carrier has opened himself up to unnecessary criticism with the manner of his discussion of Philo’s interpretation of Zechariah.